OK, folks. Here's the new Las Vegas Weekly column, in which I attempt to diffuse the most legendary feuds in modern Vegas. I kinda was hoping they would photoshop my head on Obama and Wynn and Adelson on Crowley and Gates, but they didn't. If anyone knows how to do that, it would be so awesome! Anyhow, read on and enjoy! 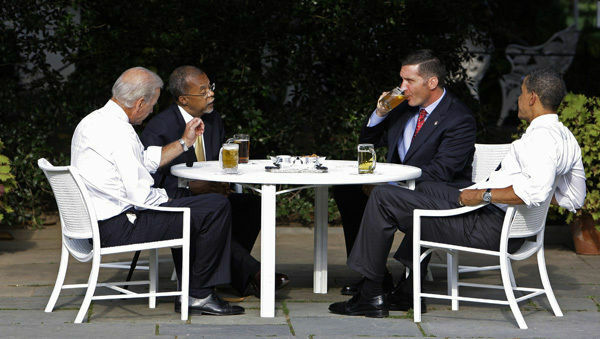 It’s been a couple of weeks now, but I still can’t get that White House beer-summit image out of my mind. There they all were, the leader of the free world playing genial host to the black professor arrested at his home by a white cop in that symbol of racial conflict, the Ivy League city. I think I know. The three of them weren’t modeling a way to diffuse tension between blacks and whites but, much more generally, between people who feud in the public square. Which brought me back to Las Vegas. Believe it or not, we have lots of prominent people who dislike one another, too. I’ve picked the five most ripe for beer-or-whatever summits. Consider this a Road Map to Peace. Yes, people! It is as it appears. 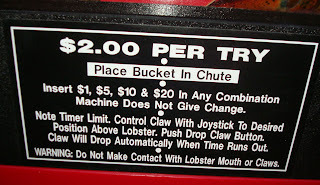 You give them $2 and you try for your very own 1-1.5-lb lobster! If you catch it, Tinoco's Kitchen at the Las Vegas Club will prepare it for you as you like it. Sides and drinks are extra. Tinoco says people catch 4-5 a day. 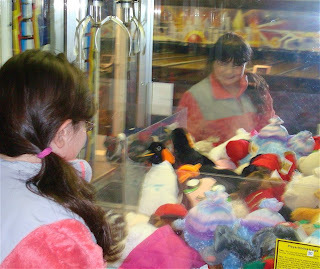 They do seem easier to get a grip on than some stuffed animal, huh? As it happens, Las Vegas is somehow NOT on the forefront of this gambling cruelty-to-animals concept. 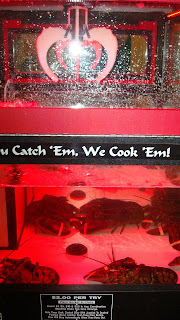 It's been around in the lobster-rich regions of the northeast for as far back as 2007 and evidently originated in Japan. Not surprising, animal-rights advocates are appalled, as seen by this piece from South Florida in May. And the blogger at SeriousEats.Com last year wrote it up, too. One of his commenters responded: "We have this machine at a bar down the street from us. 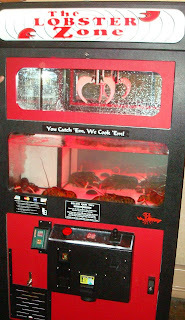 A couple of the puny lobsters have money rubberbanded to their claw to entice someone to go after them." If they tried that in Vegas, would they need to get it approved by the Gaming Control Board first? Alrighty...here's the newest show. Listen at 1:04:00 to hear how to win a pair of MJ tickets and afterparty passes! To download, right-click on the date below (or the AAC link) and save it to your computer. Or you can subscribe (it's free!) via this iTunes link or via this Zune link. Whether you buy hypnotism or not, there's no denying that Anthony Cools has Las Vegas under his spell. 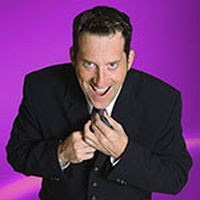 The Paris Las Vegas headliner has become a somehwat unlikely Strip entrepreneur, responsible for four shows besides his own including Bobby Slayton and Penny Lane at the Tropicana and Mental and Freaks at O'Sheas. Cools explains how he became the king of middle-brow and why he thinks some of the more disgusting acts that take place at Freaks are really "quite romantic." In Banter: Amy and Steve discuss Mental and Freaks, another MJ raid, Laughlin sees an uptick, an accidental ReHab visit, a Maggiano's deal for Amy, and more. 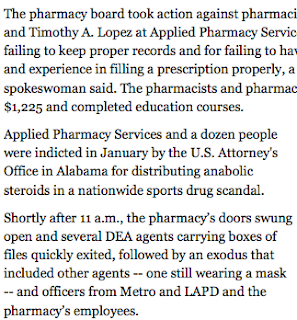 Is Raided Pharmacy Linked To Steroids Indictment? The answer to that provocative question is: No. At least not from anything I can tell. And I checked. I was waiting yesterday to see if anyone in the media would attempt to connect Applied Pharmacy Services in Las Vegas, which was raided by the DEA and LAPD in connection with the probe into Conrad Murray, Michael Jackson's personal doctor, with a company known as American Pharmacy Solutions in Mobile, Alabama, that was hit earlier this year with a 198-count indictment in a widespread steroids distribution scandal. Why would anyone confuse the two? Because if you Google "Applied Pharmacy Services," the first two responses are links to some blog that had posted about the Alabama company which is, in fact, named in an indictment as "Applied Pharmacy Services." BUT...the trail grows cold when you click on that link. Then you find yourself on the website of American Pharmacy Solutions. It's a mail-order pharmaceuticals company. They don't have branches or locations. They're not even called Applied Pharmacy Services. I suspect many other journalists followed this necessary bunny trail to its conclusion as I did for my New York Times piece on yesterday's raid. I called up the Mobile, Ala., place. Asked if they had offices in Las Vegas, were tied to this pharmacy that had been raided. They said no. They could be lying or they could have changed their name since the indictment, that's true, and nobody from the Vegas pharmacy could be reached by anyone in the press yesterday to check it out. But it appears to be a coincidence. Unfortunately, my private prediction proved correct; someone in the press did report that these were the same company without, so far as I can tell, being able to confirm it. I'm surprised to say it, but it was the normally spot-on Las Vegas Sun. This information (in that middle paragraph there) didn't appear in anybody else's reports. Not the Associated Press's, not the Review-Journal's. Not even TMZ. So, did the Las Vegas Sun have some great big scoop that everybody else in the press somehow overlooked even though it was the very first thing that came up on Google? The media wouldn't pounce with two feet on the notion that a pharmacy involved in the Jacko case also has an 198-count steroid indictment against them? As I said, the two could still be related. But I don't know anyone at this stage who has confirmed it. And the lack of being able to confirm something as simple as shared corporate parentage leads me to the conclusion that the Sun jumped the gun this time. The Strip is LIVE tonight w/Anthony Cools! Miles won't be able to leave work in time tonight so Amy's guest-hosting again, which is great because she accompanied me to "Mental" and "Freaks" on Friday, two of guest Anthony Cools' other Vegas productions. (Cools also produces Bobby Slayton at the Trop.) In my conversation with Cools, the randy and funny hypnotist at Paris who is building himself a Strip empire out of largely middle-brow and some decidedly low-brow fare explains his master plan, defends hypnotism and asserts that when a guy and a gal pierce their arms with the same skewer on stage, it's actually an incredibly romantic gesture. Plus, news from Vegas, the trivia question, a new poll, listener feedback and, as always, the Top Secret Tourist Tip of the Week. Join us live at LVRocks.Com for the studio cam and live chat room. Or wait for the podcast. Or both!